The last weeks of summer settle like the leaves beginning to turn and fall in pirouettes off their stems, and Atlas returns to his normal days of tree climbing and book reading with little interruption. At first he buys his muffins and returns his library books, vowing to be a good citizen of the world like Huckleberry Finn when he moves in with the Widow Douglas, but by the Friday before Labor Day Weekend, he has to send his first round of stolen books back to the library using his fake name and return address. That Monday, as he climbs back in his tree with the magnet-free Oliver Twist to enjoy the final day of summer and his last school-free day, his backpack holds two stolen candy bars, three sodas, and a bunch of bananas. “Who else would give you their favorite pirate’s hat because they don’t know how to apologize?” the voice asks from above him, and when he sees her crouched three branches above him, he almost falls off of his perch. She wears the same black dress she wore to their first dinner at the resort, but her hair is just plain red and she has purple circles under her eyes. “I told you never to contact me again,” Atlas says, trying to hold down the happiness welling up inside of him at the mere sight of her. Mary whistles, and two familiar blonds walk out of the forests and stand under the tree. “What are you doing here?” Atlas asks, unable to take his eyes off of Lana. “Once Mary told us the real reason you agreed to steal that money, we decided to join the cause. She claims you two can teach us enough to be useful, so we accepted these.” Lana holds up her own sword necklace, which glitters in the slanted sunlight filtering through the leaves. “A pirate heart,” Mary says with satisfaction. “Then it’s settled. Finish up your last year of high school, and then we set sail. Until then…we’ll be around.” She pushes the black hat down over his eyes, and when he pushes it back up again, they’re gone. 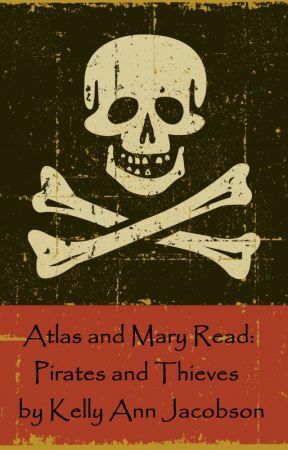 This is the last section of Atlas and Mary Read Part I. Starting on 9/18, author Kelly Ann Jacobson will begin posting Part II. Thanks for reading!